Having a small kitchen does not mean you need to compromise on efficiency or style. In fact, it could mean an opportunity to optimize this hard-working part of your home and making sure you waste neither space nor energy. Be brave and let go of the conventions. Less will give you more! Carrie Bradshaw kept sweaters in her oven, and many could take a cue from her: Use your empty space. If you know you won’t ever need a large oven, why not do away with it altogether? Just because every other kitchen has a full-sized oven, that doesn’t mean you need to. This little baby will be perfect for breakfast toast, as well as the occasional quiche/lasagna/cake/cookie affair. Multi-use appliances are not items we often spot in the kitchen, but a convection and microwave truly a smart choice. Don’t worry, you won’t be microwaving the chicken you actually want to roast. In addition to the microwave power, these appliances have a separate convection heating element, ensuring crisp roasts and tender cakes. 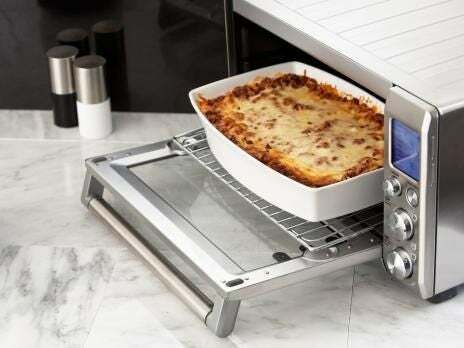 They take up less space than a conventional oven, and eliminate the need for an additional microwave. How much of your refrigerator do you actually use? If you want to save serious space, and think you can get away with it, go for an “apartment size” or even an under-counter model. In addition to the absence of a clunky box dominating your kitchen, this option gives you the added advantage of more counter space! These right-sized units will discourage you from growing “science experiments” with foods that are well past their sell-by dates. Many under-counter refrigerators don’t come with a freezer. But don’t let that deter you from achieving a sleek, space-efficient look. Under-counter freezers are also readily available to go alongside their refrigerator counterparts. Separating the freezer from the fridge will also allow you to place the units wherever you like. They’re a great modular solution. It’s not a question of how much you cook, but how many burners you really use when you do. Cutting down your stovetop size by more than half could you give you much-needed prep space. You might not even miss those superfluous burners! Another small cook top that fits any bill. Chefs may glory in gas range cooking, but how about an induction cooktop for a sleeker and much more energy efficient option? Because they don’t need to be tethered to a gas line, they are more flexible to place, allowing you to optimize your use of space. And clean up will be a breeze since food won’t cake on, and you don’t need to clean around burners or under grates! Think a dishwasher is luxury you can’t afford in a tiny kitchen? Save space and water by opting for a 18 inch wide, nine place setting capacity unit. This Bosch unit even has a super-handy, shallow third rack for hard-to-stow small stuff. Large enough for bigger pots and pans and small enough that, especially with a half-load option, you can run it everyday without wasting water. And that will prevent those nasty smells from day-old dishes in larger dishwashers. Drawer dishwashers should be no-brainers in smaller households. At only about 18 inches high and 23 inches deep, this small wonder by Fisher & Paykel still holds up to seven place settings and has nine setting options to make sure you can save as much water and energy as possible. This is technically not an appliance, but a kitchen space saver nonetheless! Corners are often dead spaces along a countertop, to be filled up with decorative cookie jars and cookbooks. Why not place the sink there and gain some usable counter space? A ventless, counter-depth washer/dryer unit is perfect for small apartments. A disadvantage seems to be that wash/dry cycles take longer than with regular, separate machines. But we’ll take it, since these two-in-one units certainly save space.